← Be one of the first to Share! The Division of Speech and Hearing Sciences’ 40th Anniversary celebration was a great success, with a nice turnout from classes dating back to the 70’s. 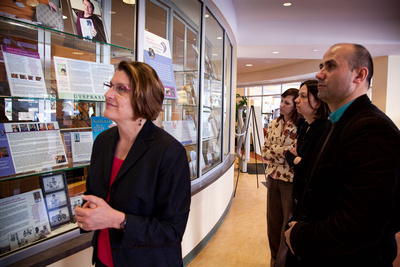 In addition to tours of their new headquarters in Bondurant Hall, attendees came over to HSL to see the exhibit. Former DSHS students shared memories with HSL Allied Health Sciences Liaison Barbara Rochen Renner, who initiated the exhibits (one physical, and one online) and worked on a number of aspects of them.